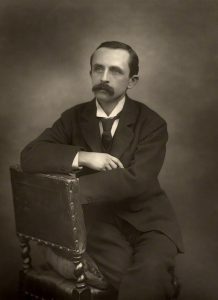 I first encountered J. M. Barrie when I was seven. But not through Peter Pan. In 1970 my mum was working in the costume department at the Dundee Rep during a production of The Admirable Crichton and due to a child-care crisis I ended up in the stalls one day after school. Family legend has it that I got upset by the director’s ‘robust’ exchange with the actors and was taken backstage afterwards to see that it was all a theatrical illusion, not ‘real’. I met Crichton himself, removing his makeup. I was hooked on theatre from that point. In 1978 I saw Andrew Birkin’s J. M. Barrie and the Lost Boys on TV and became interested in Barrie himself. In the early 1980s, while a student at St Andrews, I frequented the coffee shop which claimed from a blue plaque outside to be the home of the ‘real’ Admirable Crichton and inside had a beam bearing Barrie’s name on the roll call of former Rectors. The man and the play just wouldn’t let me go. Fast forward to 1989 and I encountered Dear Brutus and Mary Rose at Drama School. I was amazed and impressed by the complexity of the plays, which weren’t ‘fashionable’ at that time but under radical directorship they revealed all kinds of things beyond the light Edwardian drawing room fare they were then categorised as. A decade later I started on a PhD looking at S. R. Crockett and J. M. Barrie’s ‘ordinary heroes’ as examples of the Scots Romance tradition. Health and finances meant I had to abandon formal study, but neither author fully let me go. In 2002 I was dramatist in residence for Dumfries and Galloway and tried at every turn to champion Barrie and his Dumfries connection – including a symposium day to commemorate the 100th anniversary of The Admirable Crichton. The day included a talk by Prof Ronnie Jack and a production of my own modern version of the play Down the Line. The play was performed by OUDS in Oxford the following year and in 2004 (the 100th anniversary of Peter Pan) I was involved with a number of projects, including writing a Peter Pan education pack. More than another decade has passed. Life goes on. Barrie stays there in the background of my life, like a shadow I can’t get rid of. Not Peter Pan, never Peter Pan, (though I’ve dabbled with some of the earlier incarnations lately) and not so much the drama as the prose – including the ‘crossover’ works such as A Well-Remembered Voice. Whichever other Scots writer I am focusing on at any time, Barrie always seems to be there in the background. I would have joined a J. M. Barrie Society any time in the last 40 years had one existed. The death of Prof Ronnie Jack late last year (and my experience setting up and running the S. R. Crockett literary society The Galloway Raiders) got me thinking that perhaps it was time to stop waiting and start doing something. Somewhere between the now cliched quotes: ‘to die will be an awfully big adventure’ and ‘there are few more impressive sights than a Scotsman on the make’ I hope we’ll be able to dig a bit deeper, set up and offer a tribute to Barrie and in the process honour the memory of Prof Ronnie Jack who was his greatest advocate of recent years. Someone has to do it. Why not join me? Cally Phillips is an independent researcher, with strong interests in Scottish Victorian literature. For more information on her interests, see our Associates page.